Danfoss LX Electric Floor Heating is an affordable luxury that brings warmth to life. Underfloor warming is a proven technology that's safe, reliable and energy efficient. Our electric floor heating systems were designed with the installer in mind: pre-applied heating cable, single point connection, self-adhesive backing, quick installation, genuine 10-year warranty. For renovation and remodelling, the ultra thin electric heat mat can be laid directly in the tile adhesive, enabling you to make a new floor on top of the old one. Imagine being able to install a warm floor without going through the expense, clean-up, and fuss of having to break up the old floor. Imagine being able to enjoy a complete heating system which take up less than 1/8 inch of floor height. 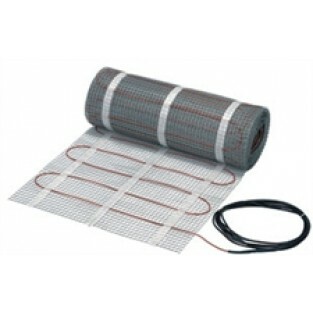 The Danfoss LX electric heating mat 088L3183 is a 2 x 55 foot mat for a total of 110 square feet. The mat is 240 volts/5.5 amp and 1320 Watts. Our customers do not just buy a heating cable or a thermostat. A Danfoss customer buys an integrated heating system -- a warm floor, for example. This means that Danfoss has a genuine 10 year non-prorated warranty to cover the entire heating function of the floor (LX, GX, and TX mats and cables only). If installation is performed by an authorized installer and the warranty certificate has been filled out and sent in, Danfoss will guarantee the floor heating for 10 years. In the event of a fault that can be traced back to a manufacturing defect in a Danfoss or mat or cable, Danfoss will cover the cost of the product itself and cover any damage to bricklaying and tiles, for example, at no extra cost to the customer.